Diesel and Gasoline Generators for commercial use in a large variety of sizes and from numerous manufacturers, from single phase to three phase, and units ranging in capacity from 3 KW up to 2,000 KW. 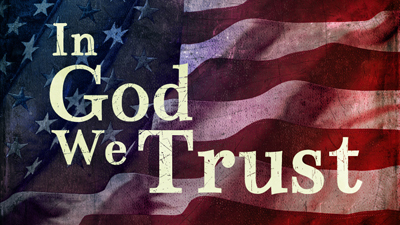 We also offer natural gas and marine generators. Our main sources for small gasoline generators are Honda and Onan. 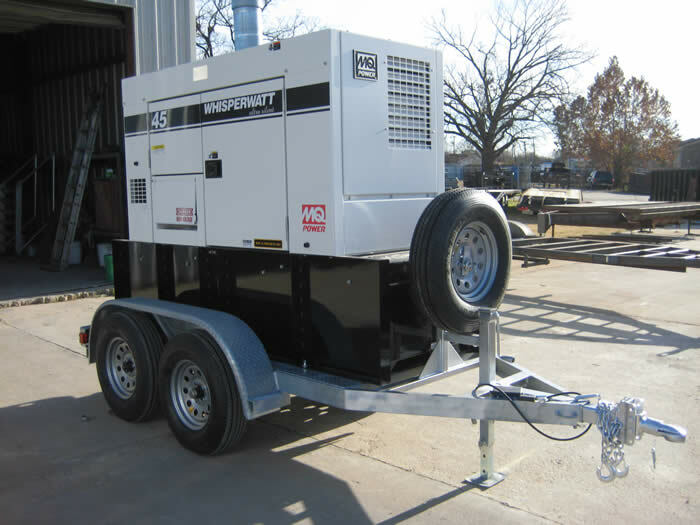 Our main sources for all sizes of diesel generators are: Engine Power Source (EPS), MQ Power (Multiquip), Broadcrown, Kubota, Cummins, Caterpillar, Kohler, Generac, Hipower, Onan, and Triton Power. Engine Power Source (EPS), is our preferred generator source for all of our products, as they only use Kubota engines. 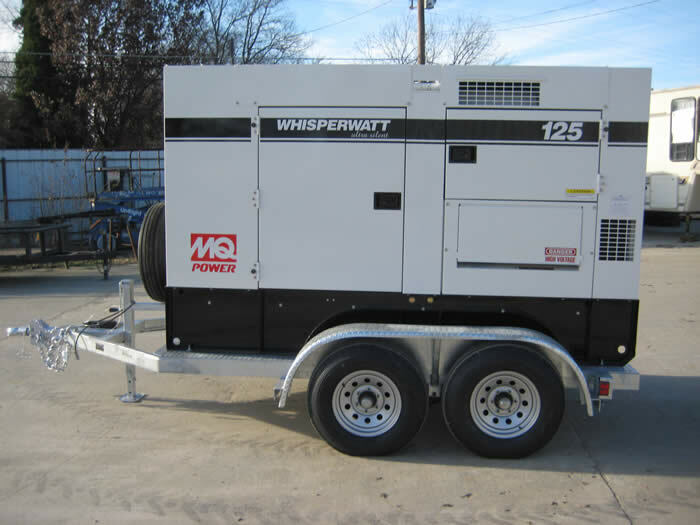 For vans and small power requirements, our preference are Cummins Onan commercial diesel generators, due to their superb quiet designs. 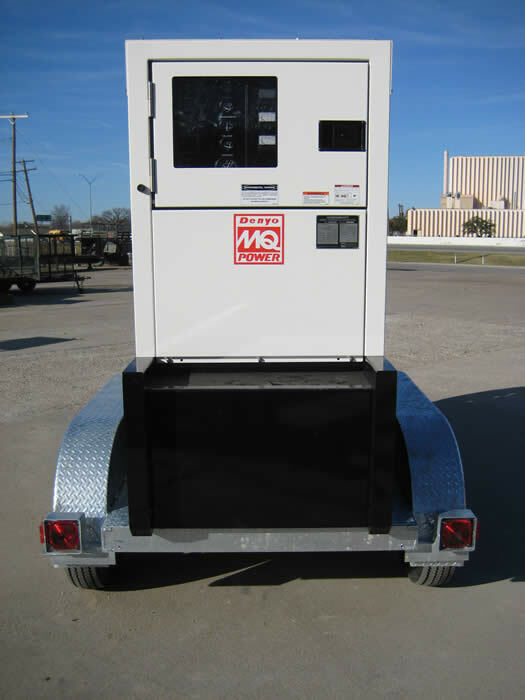 MQ Power, manufactured by Multiquip, has been selling generators for a long time, and they have a great reputation for Quality. And, they are used extensively in rental fleets with the major US rental companies. Their Whisperwatt and Ultrasilent models offer some of the most quiet generators in the market. In adition, they offer a very good warranty on their units. Broadcrown generators offer superb quality as well, with state of the art features, as well as engines manufactured by well known companies such as Mitsubishi and John Deere. 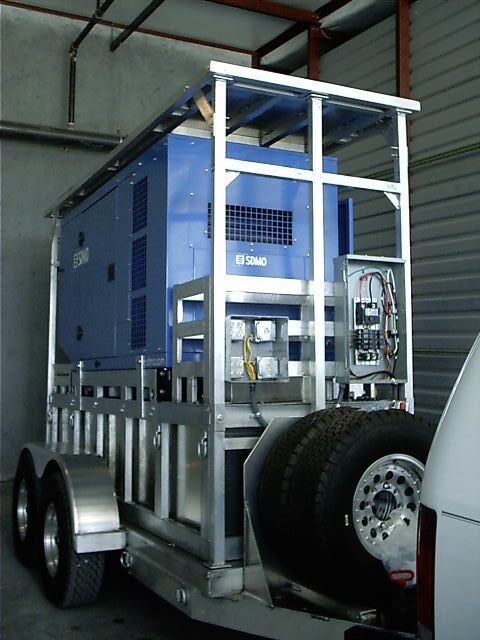 For the generators from Triton Power, we offer units with engines manufactured by Mitsubishi, Isuzu, John Deere, Perkins, Cummins, Detroit Diesel and Kama. For the large units, we can sell them with or without sound attenuated enclosures. Due to our experience with our mobile applications, we are very experienced in wiring automatic transfer switches into most generators equipped for use with an ATS. In addition, we recently learned how to connect an ATS to a small Onan LP generator that is not equipped with the ATS feature. 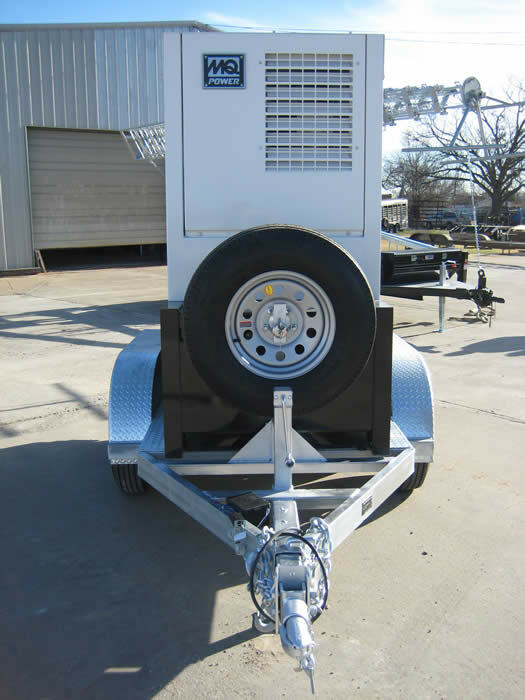 In addition, we offer custom trailers for all of the generators that we sell. And, we offer accessories, such as base (belly) or external fuel tanks including our own custom all aluminum fuel tanks with baffles (configured and sized as required) single or double wall with level sensors (and leak sensor for double walled only), phase selector switches, manual or automatic transfer switches and generator connectors or cables that we will integrate into the solution. 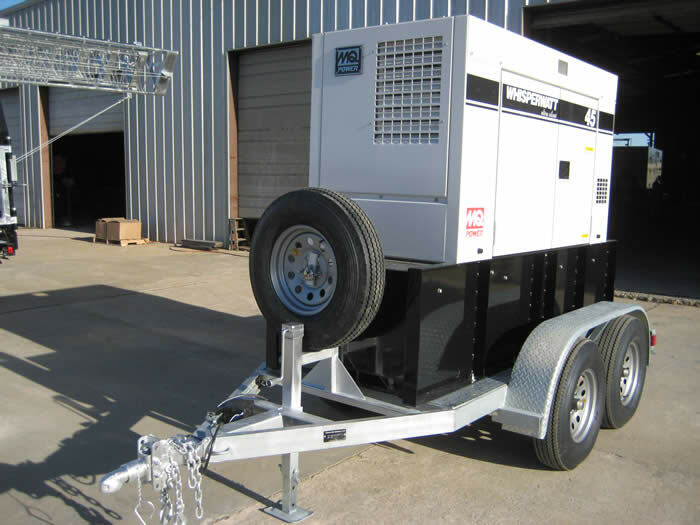 We can custom design and manufacture a trailer for a specific generator and its accessories. 1. Multiquip (including Multiquip Globug lighting systems, Multiquip Modular light towers, Multiquip Night Hawk light towers and Multiquip Moonlight system). 2. Allmand Maxi-Lite series of generator light towers. 3. Bossltg, which builds custom generator light towers with numerous options per the customer's request, including very large units in the 50 - 100 KvA range. Our generators, light tower systems and accessory prices are extremely competitve; less expensive than going directly to the manufacture and among the best in this market. The first (4) photos below show one of our custom trailers with a 25 KW MQ Power generator, DCA25SSIU2, integrated with a 100 gallon external fuel tank. 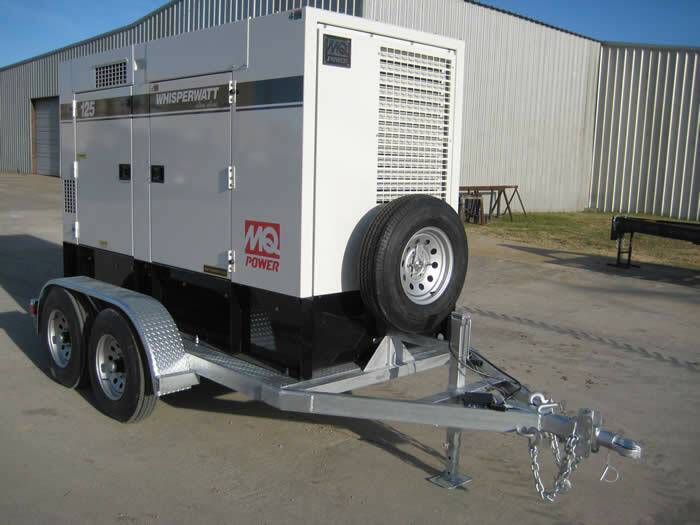 The next set of (4) photos show one of our customer trailers with a MQ Power DCA45USI2XFC (45 KVa / 36 KW) generator equipped with a 198 gallon internal tank. And the last set of photos includes (3) photos that show one of our custom trailers with a MQ Power DCA125USIC (125 KVa / 100 KW) generator equipped with a 200 gallon internal tanik. There is also a photo in this last set which shows one of our custom generator trailers that includes custom aluminum tubing construction, including a custom aluminum fuel tank that the generator is installed onto. MQ Power DCA45USI2XFC equipped with an internal 198 gallon base fuel tank, dual axle trailer equipped with (2) 3,500 lb axles and removable hitch. 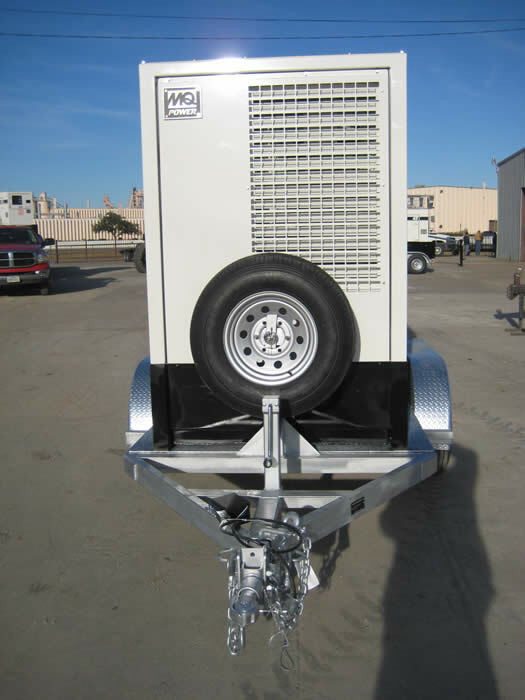 MQ Power DCA125USIC equipped with an internal 169 gallon base fuel tank, dual axle trailer equipped with (2) 5,200 lb axles and removable hitch.